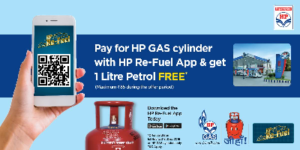 Hey, In this expensive era, go and loot this offer, only by paying HP GAS Cylinder with HP Re-Fuel App and you will get get 1 Litre Petrol FREE. So Hurry up! How to get 1 Litre Petrol FREE? 2. Login/ Singup into your account. 3. Click on Pay Merchant. 4. Pay for ‘HP GAS Cylinder’ with your Suitable mode of payment. 5. Done!! you will get Rs 85 cashback in your account which worth 1 Litre petrol. 6. Now go to Petrol Pumps near you and pay through this app.